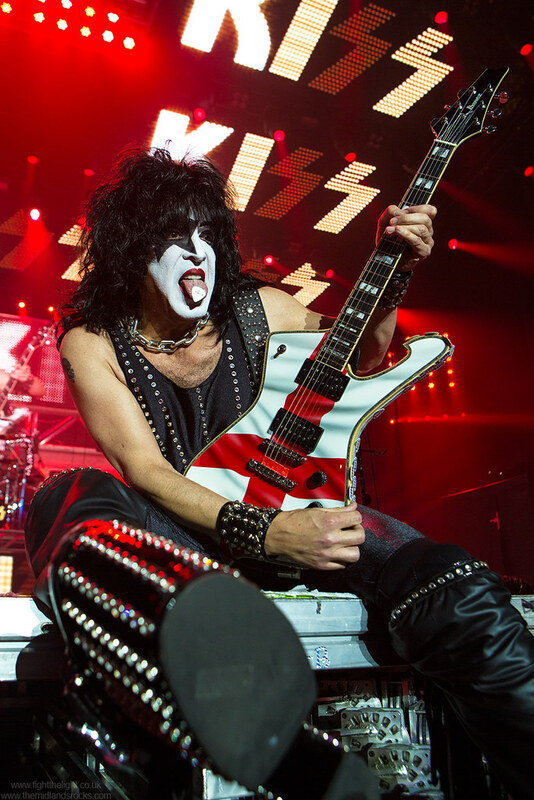 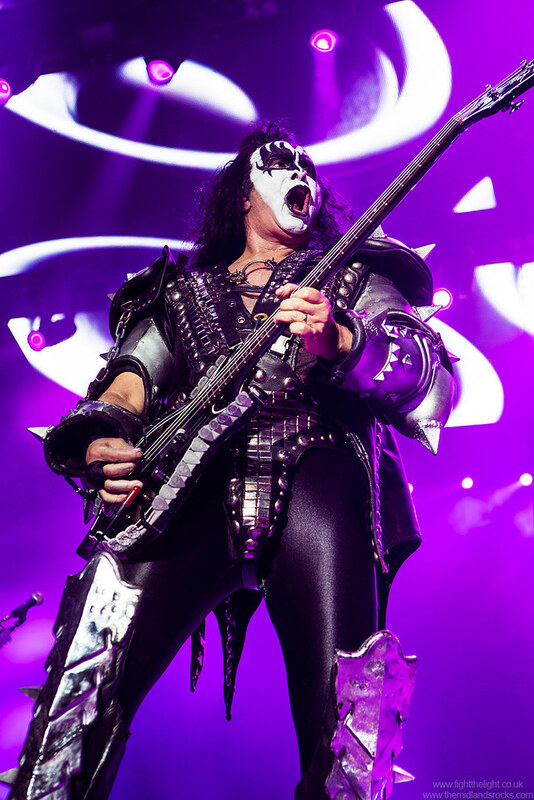 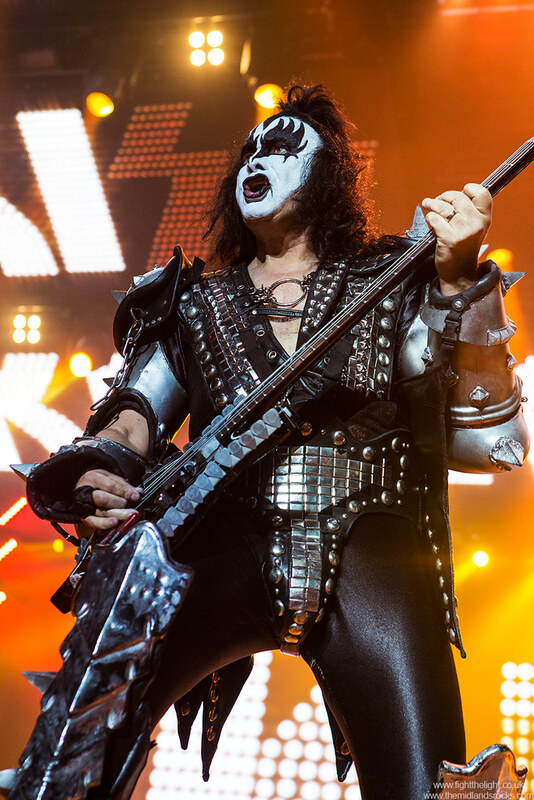 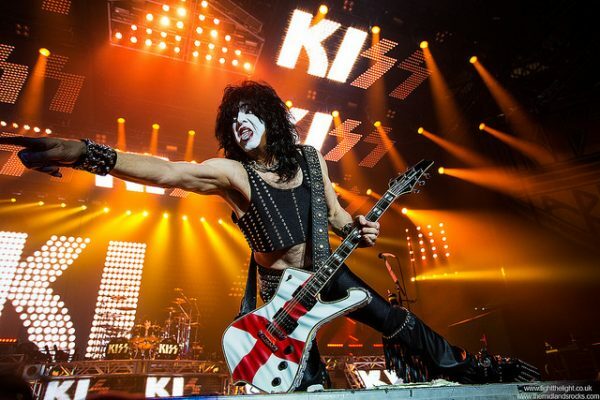 It’s been half a dozen years since KISS played arenas in the UK, a gap broken up only by the odd Download appearance and a one-off at the Forum in London. This visit, part of their lengthy Kissworld 2017 tour, has already been marred by the cancellation of the Manchester show, scheduled a couple of days after the Barclaycard Arena gig, following the senseless and tragic bombing. Because of that, security was understandably extremely tight around the arena, with queuing carefully controlled and armed police very visible and thorough body searches on entry, which eventually meant a delayed start to the gig, and as The Dives began their set 10 minutes later than advertised, there were still lengthy queues outside. The Dives are a 4-piece band from the USA, and in the late 1970s would have been filed under ‘Power Pop’, but, especially in songs like ‘Don’t Take It Easy’, there was a hint of Springsteen at his poppiest. 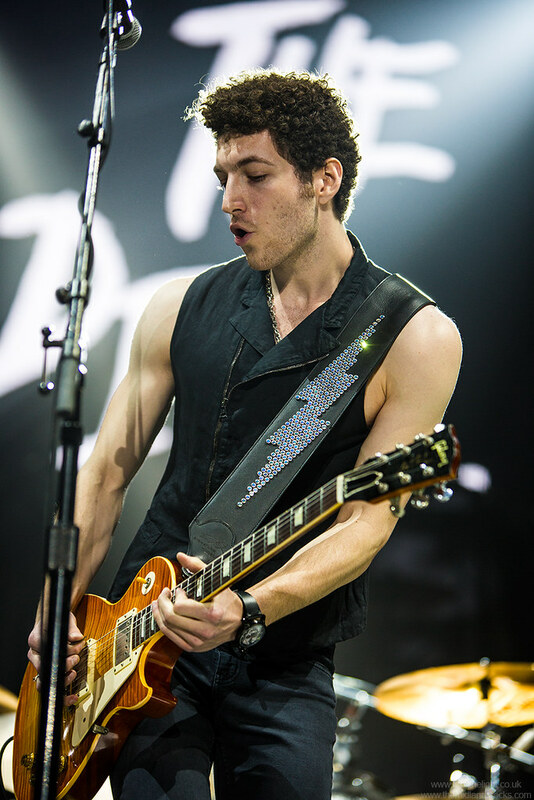 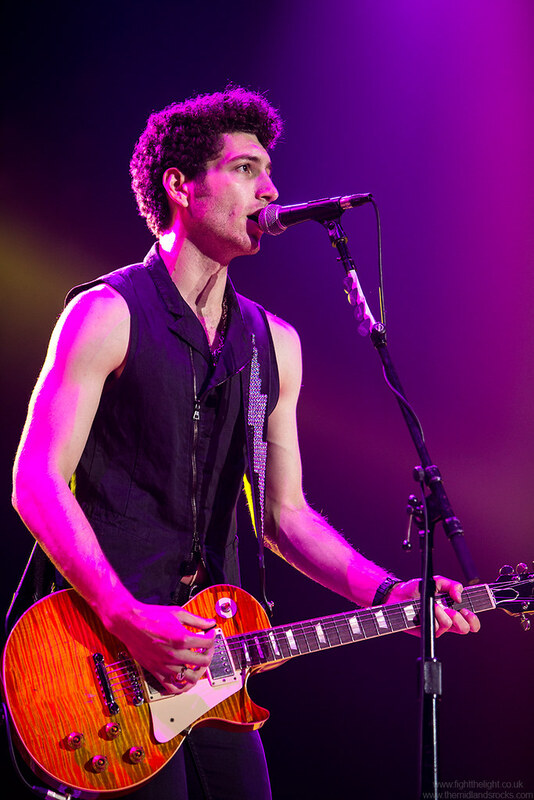 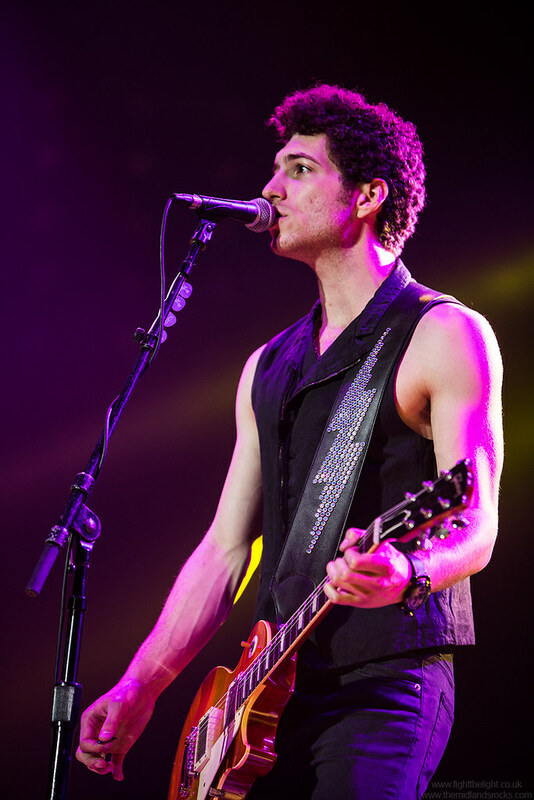 The influence wasn’t as obvious as with a band like the Gaslight Anthem, but it was definitely there. Apart from that, their songs are lively with an ear for a decent hook. 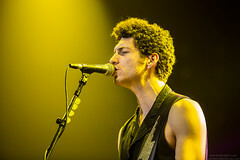 All through the set, and including their grungy cover of The Beatles ‘Don’t Let Me Down’, their energy never let up, and they went down well with a steadily growing crowd. 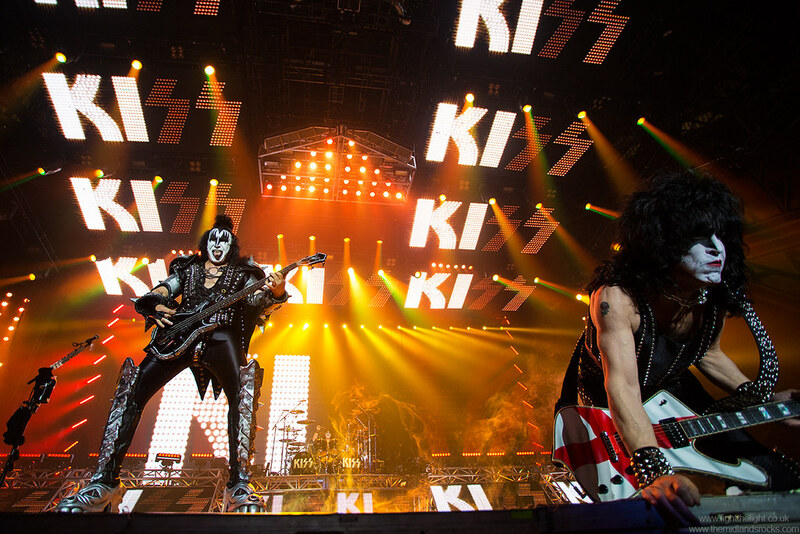 A mention too for the fact that, while they obviously didn’t have full use of the stage production, fair play to Kiss for giving the support band a light show almost as big as used by some headline bands who’ve played this arena. 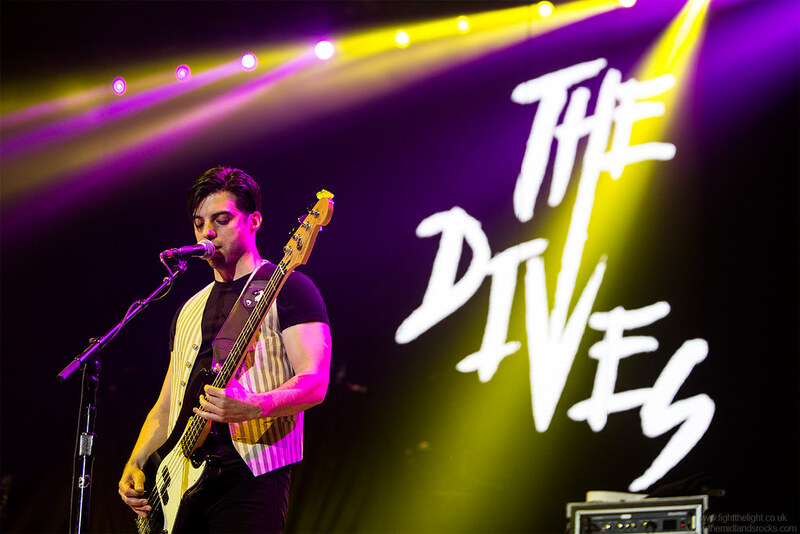 The Dives may have been a slightly surprising choice to support Kiss, but they certainly gave a good account of themselves. 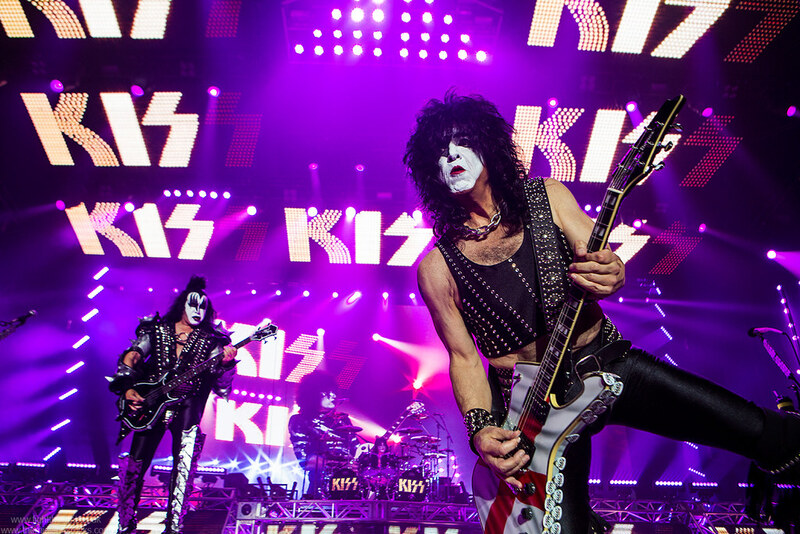 One thing that came up regularly in conversation before this gig was how many more chances there would be to see the band play in this country, but if this was going to be the last time we see KISS in Brum, they certainly said goodbye with a bang. 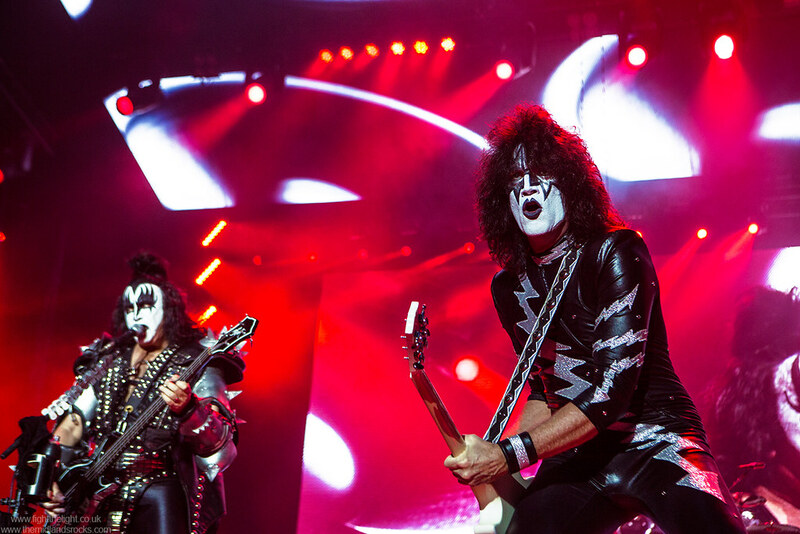 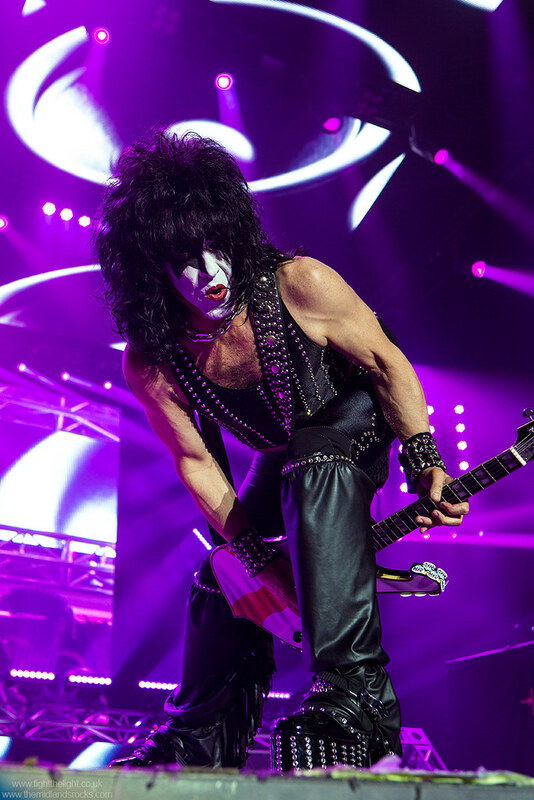 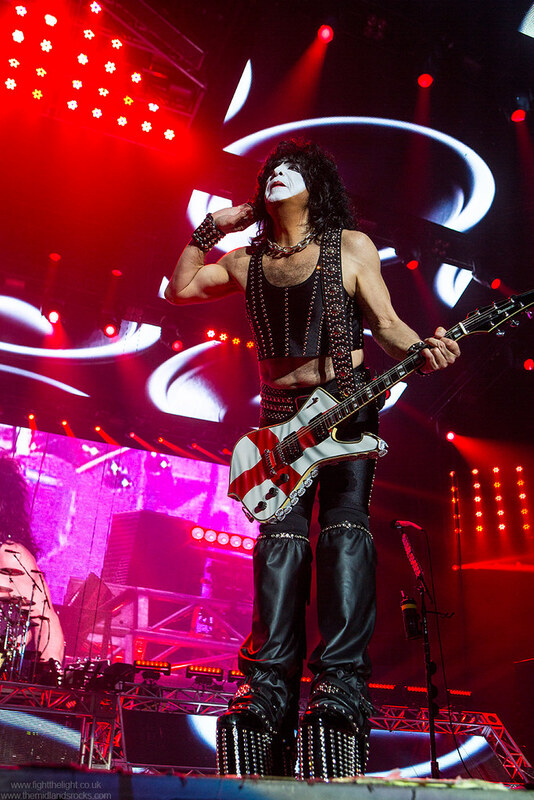 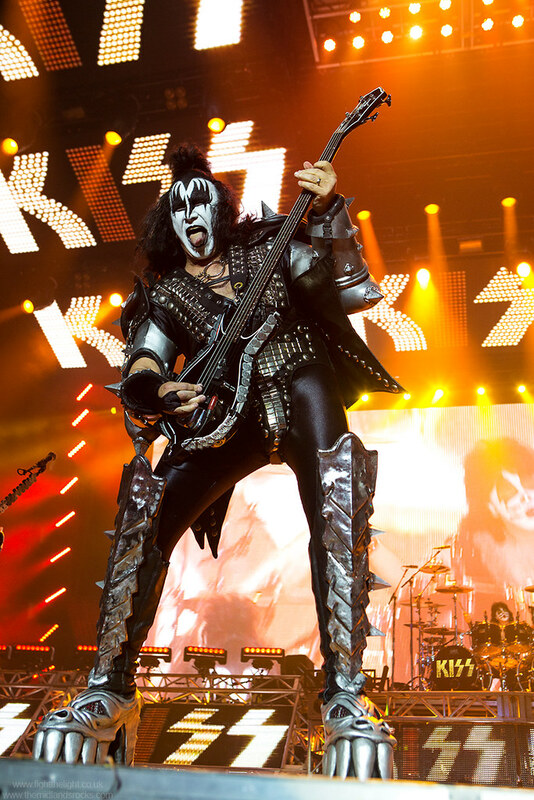 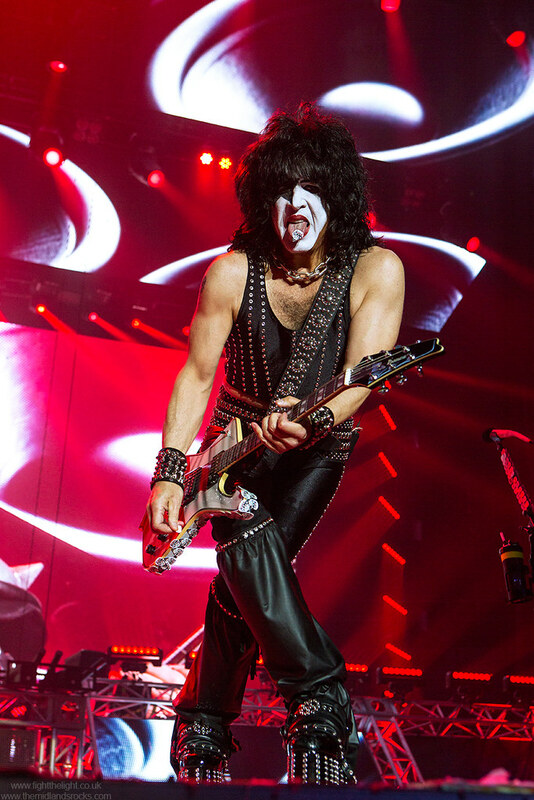 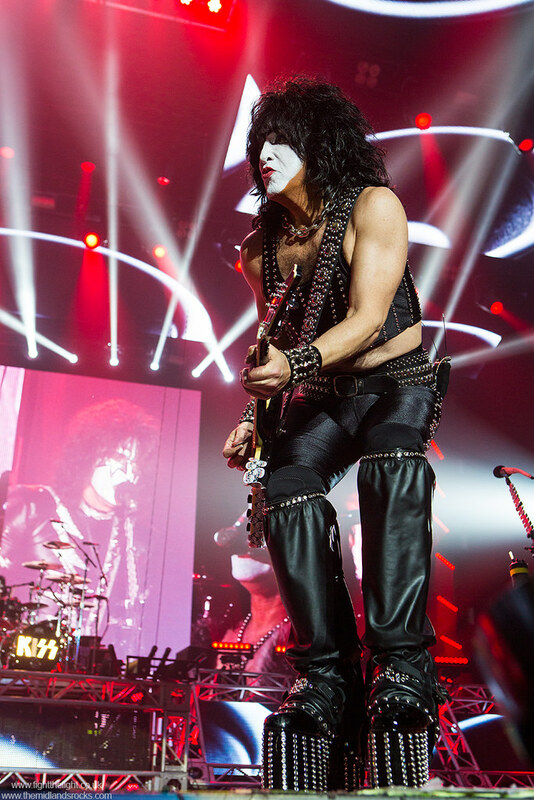 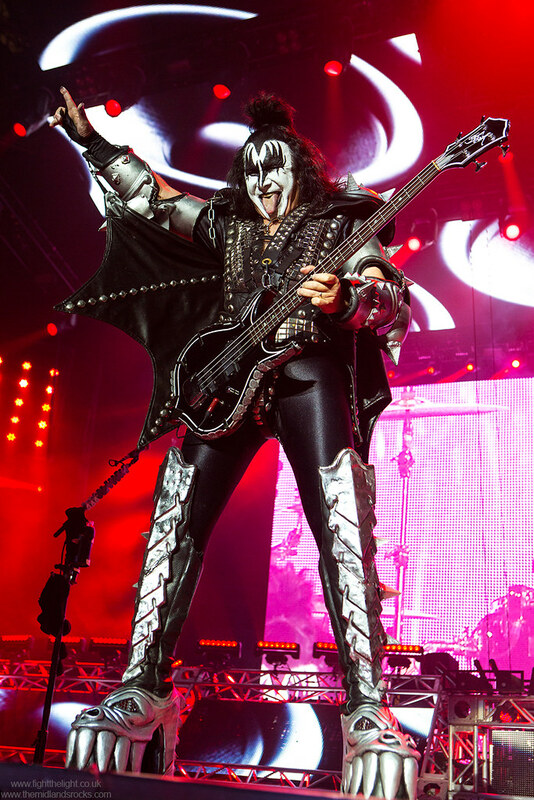 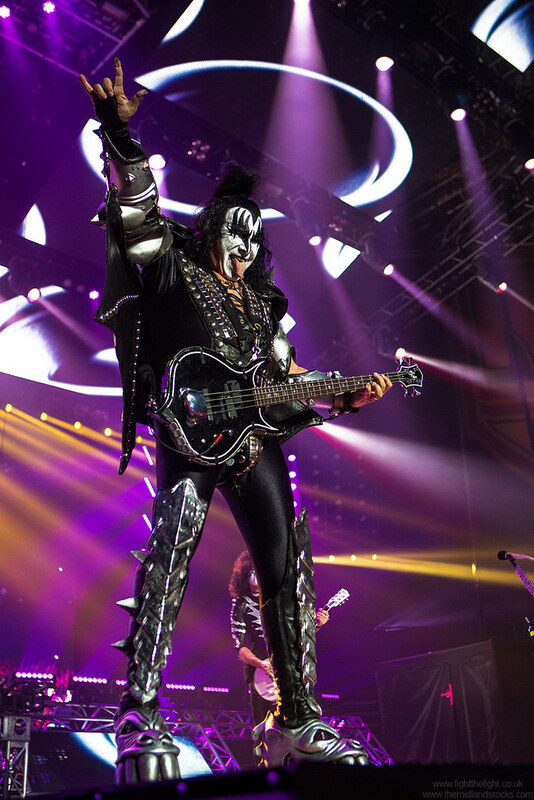 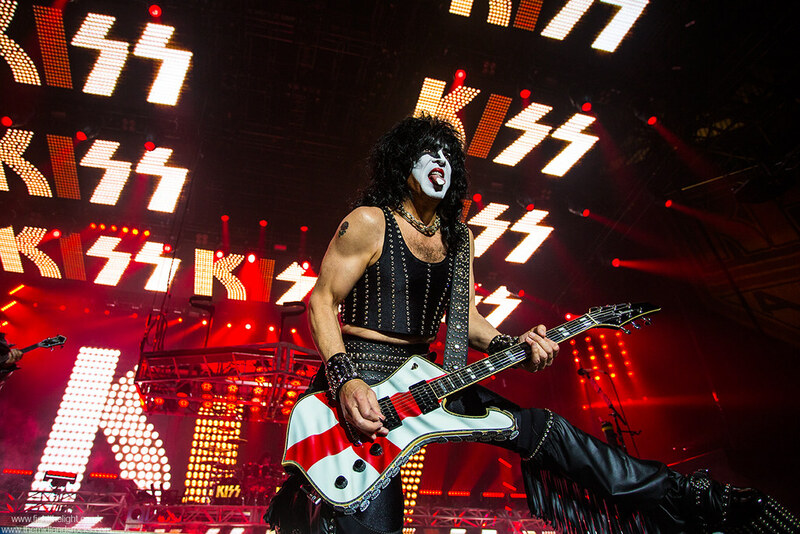 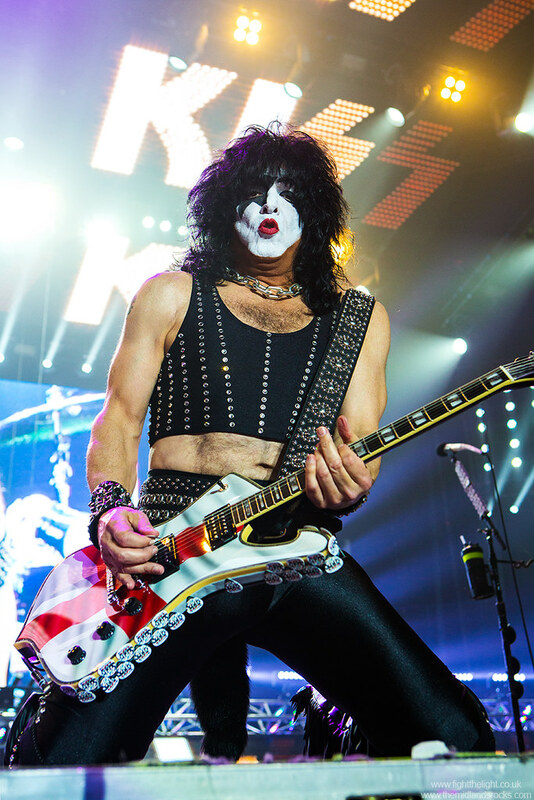 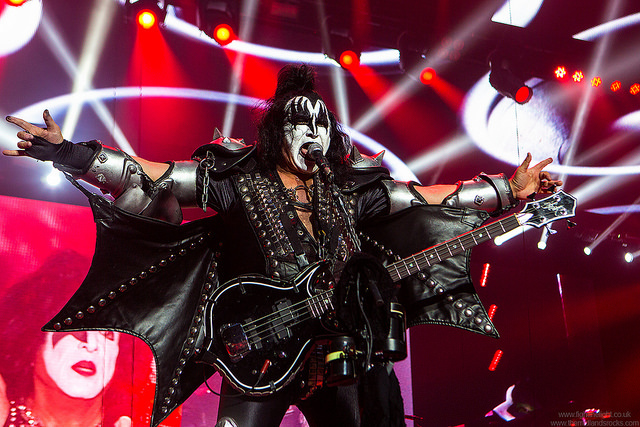 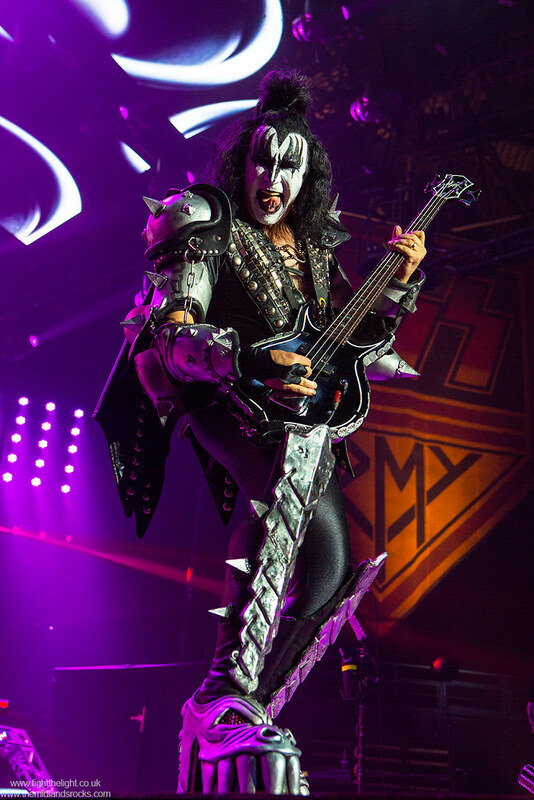 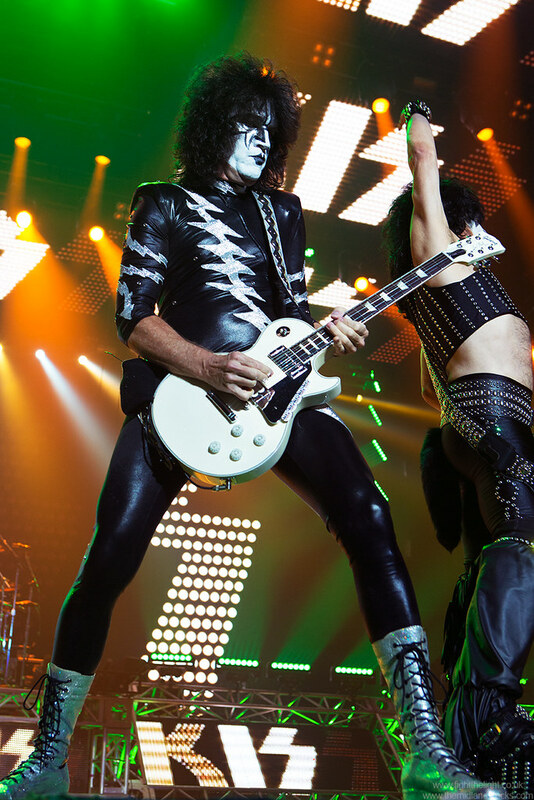 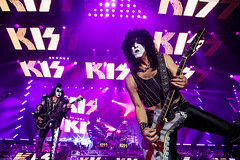 With Kiss, you generally have a good idea of what you’re going to get, both in the setlist and the show, and the band do their absolute best to live up to your expectations. 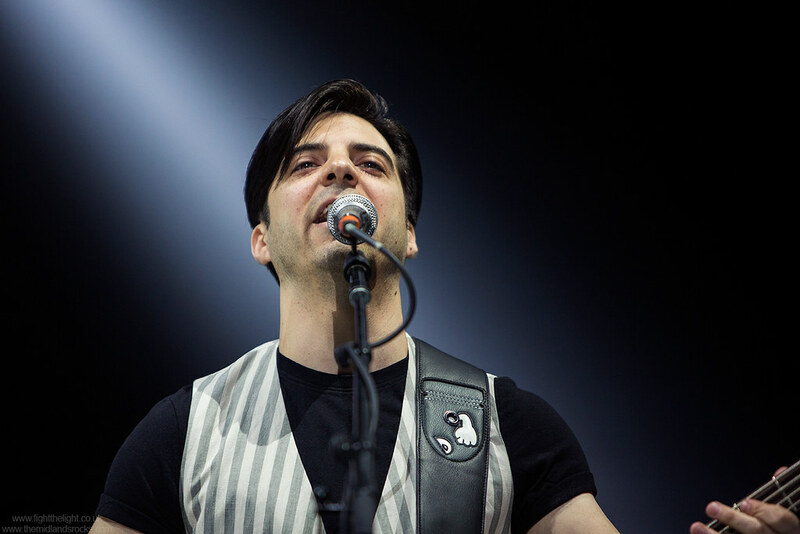 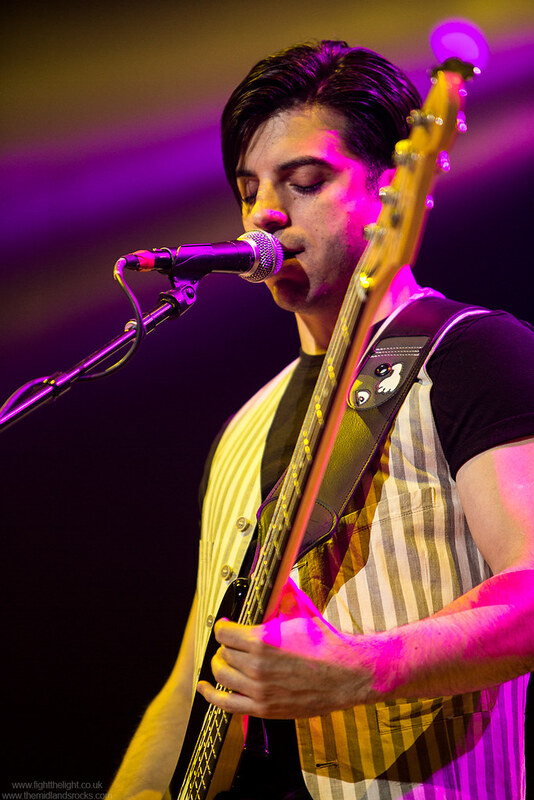 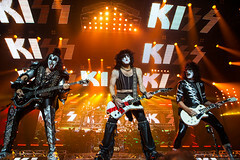 The show opened with the familiar introduction of ‘You Wanted The Best…’, the curtain dropped in an explosion of light, and the band were lowered on a platform down from the lighting rig to open with ‘Deuce’. 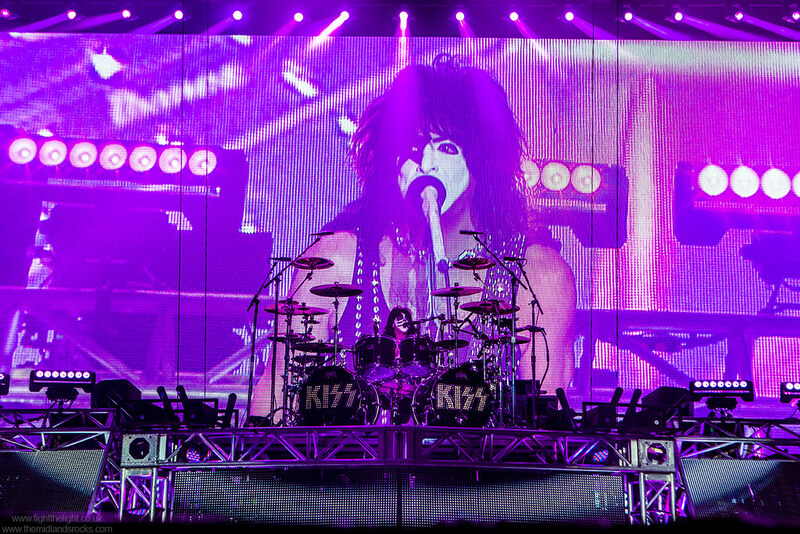 The whole light show burst into life, the huge Hi Definition screen at the back of the stage lit up, and the band proceeded to put on probably the best show I’ve seen them play since they resumed the make up in the mid-1990s. 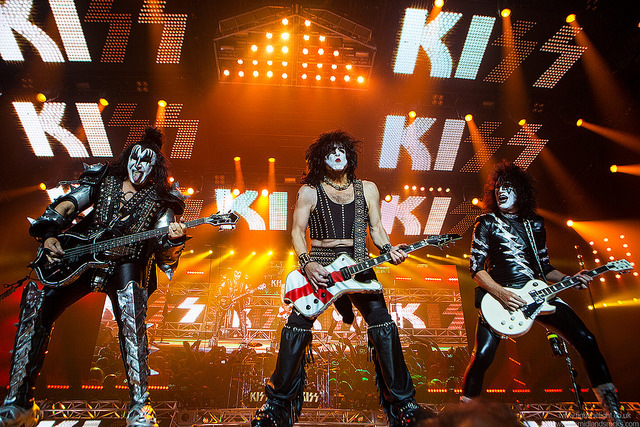 Most people could probably make a fair guess at the make-up a Kiss show and they would probably be correct 90% of the time. ‘Firehouse’ saw Gene Simmons’ fire eating routine, Tommy Thayer sang ‘Shock Me’, and played a solo that included him shooting sparks from his guitar, although being honest, this was a little tame compared to Ace Frehley’s old stunt of having a guitar belching smoke before it was hoisted up into the lights, which he then shot down with ‘rockets’ fired from another guitar. 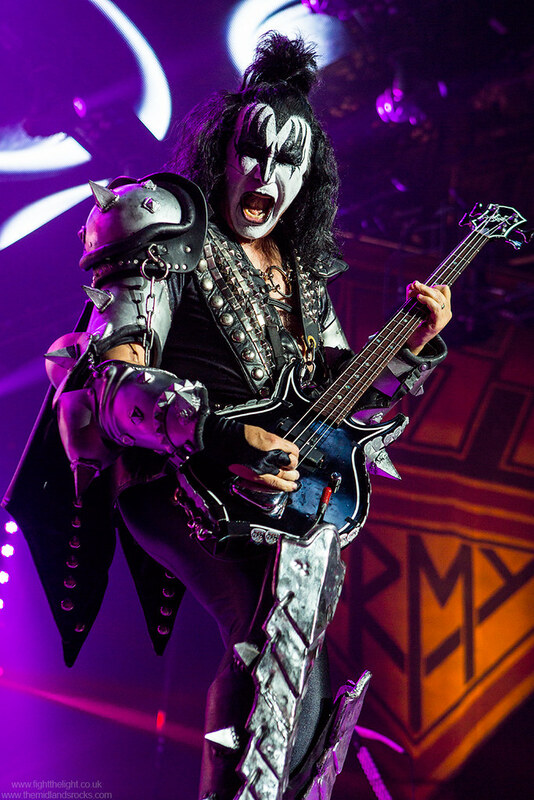 Gene was also lifted up into the lights for his blood spitting in ‘God of Thunder’, with the stage filled with green and purple lit smoke. 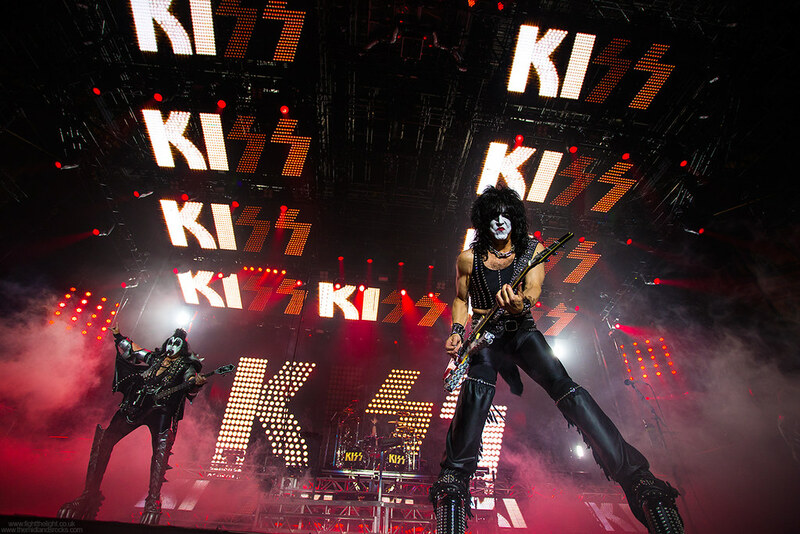 Not only does it remain one of Kiss’ greatest songs, the whole routine rarely fails to thrill. 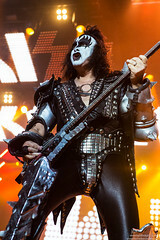 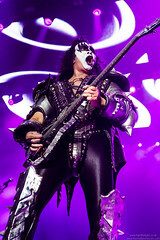 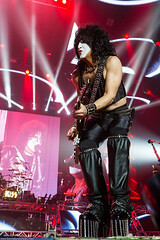 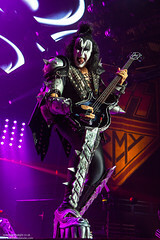 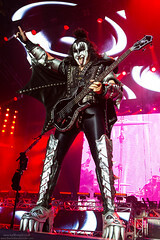 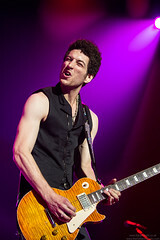 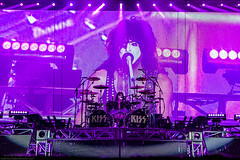 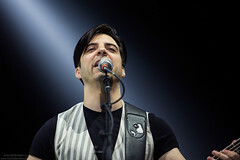 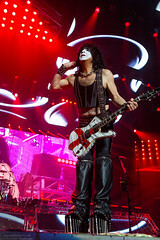 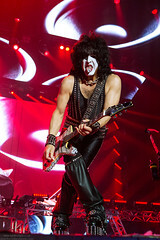 While some of this is part of every Kiss show, they still managed to include some new effects and put a couple of surprises into the set list. ‘Lick it Up’ saw Thayer and Stanley raised on a platform at the front of the stage framed by lasers, and included some of ‘Won’t Get Fooled Again’ in the song and then the unexpected inclusion of ‘Flaming Youth’, accompanied by a visual history of the band’s early years on the screen and a nod to the band’s recent history with ‘Say Yeah’ from the ‘Sonic Boom’ album. 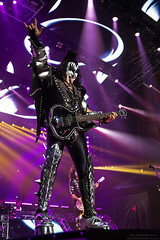 There was also an absolutely blistering ‘War Machine’, which, musically at least, was the highlight of the show. 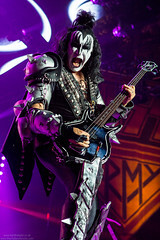 The latter part of the show, though, was mostly about Paul Stanley, having earlier asked the crowd for a moment of silence in honour of the victims of the Manchester attack, he later paid tribute to the bands from this area that had influenced him, Sabbath, Robert Plant etc, before he stepped into a wire that flew him over the audience to a raised platform in front of the mixing desk, firstly to sing ‘Psycho Circus’, again a slightly surprising addition to the set list, before playing the intro to ‘Black Diamond’, sung by Eric Singer while Stanley ‘flew’ back to the stage as the production team threw everything into the show, fire columns, lasers, confetti cannon, explosions, not to mention Stanley adding his guitar smashing routine to round off the main set. 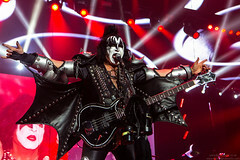 The encores were ‘I Was Made For Loving You’, then ‘Detroit Rock City’, with Thayer and Simmons stepping onto their own hydraulic platforms which carried them up and over the crowd. It had been a tremendous show, ending with the band taking their bows to ‘God Gave Rock’n’Roll to You’, and the crowd taking up the chorus as they streamed out into the night. 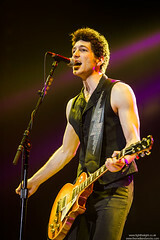 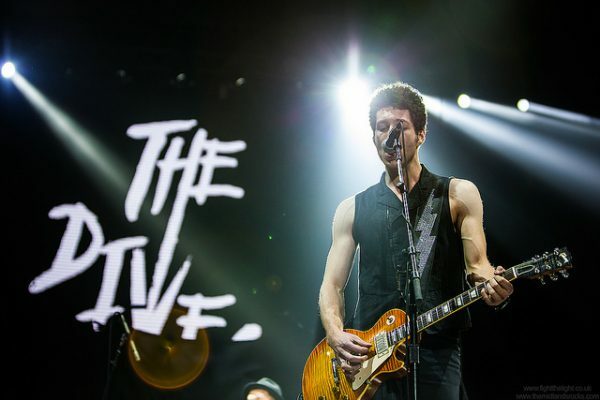 This show was so much better than their previous appearance in Birmingham, and if this was the last time they grace the city, or play arenas in the UK, it was a really high note to go out on. Ahhh bless ya, the lighting is the real star here!